Federico Finchelstein is a Professor of History at The New School for Social Research and Eugene Lang College. He has taught at the History Department of Brown University and he received his PhD at Cornell University. 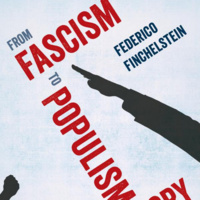 Federico Finchelstein is the author of five books on fascism, populism, Dirty Wars, the Holocaust and Jewish history in Latin America and Europe. His new book: From Fascism to Populism in History (University of California Press, September 2017). Presented by The New School for Social Research and Eugene Lang College.